The visa 90/180 days rule is a policy implemented by the Schengen law called Schengen Acquis which says how much time visa-exempt or visa tourists can spend in the Schengen area. Both visa-free tourists and short-term Schengen visa holders are subject to the 90/180 days rule. 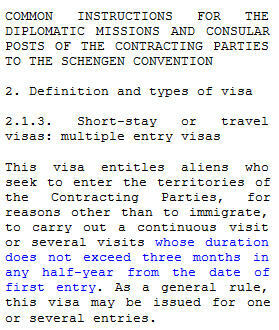 See here for more details on visa categories: Schengen visa categories. The visa 90/180 days rule was established by the Schengen Acquis which is the European community law that established the so called Schengen zone and all the rules that relate to the movement of people within the zone. The visa 90/180 days rule means that the Schengen zone visitor or the Schengen visa holder can travel freely within the Schengen zone for a maximum stay of up to 90 days in any half year period. The 90/180 days rule means that once the visitor has spent a total of 90 days in the Schengen zone (either consecutively or separately) within any half year, he or she must leave the Schengen zone. In the simple scenario, if the visitor stays in the Schengen zone for 90 days, he or she must then remain outside ALL the Schengen member states for at least 90 days. If the visitor comes and goes, he or she must count the days so that he or she does not stay over 90 days in any consecutive 180 days. A reference to the 90/180 rule can be found in the Schengen Acquis. The 90/180 days rule is referenced in many places. One of the most evident paragraphs of the Schengen Acquis that mentions the visa 90/180 rule is the section called "Common instructions, chapter 2. Definition and types of visa". 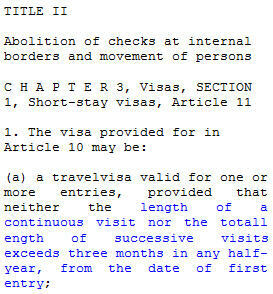 This paragraph references the visa 90/180 days rule as shown in the picture placed above this paragraph. Another important section of the Schengen Acquis that references the visa 90/180 rule is the Title II, chapter 3 which explains what types of visa can be provided. See the picture below. Some travelers claim that getting a new passport is a way around the visa 90/180 rule. The Schengen zone authorities are interlinked with a number of database systems which are being improved so that agencies, consulates, embassies, and other government authorities are able to share information on visitors. See the Schengen information system page for more details. Does January 1st reset the 90/180 days rule clock? No, this is a myth. The Schengen Acquis does not say the clock would be reset on January 1st. Some travelers report that border controls are less stringent when traveling via ground borders (traveling by car, bus, on foot, etc.) as compared to border controls when traveling via airport. From this perspective, it might be possible that overstaying Schengen visa may go more likely unnoticed if traveling by some other means than by air. The visa 90/180 days rule is "reset" upon a change in status, i.e. when switching from a long-term visa (for example students) to a regular visitors visa or to a visa-exempt status. The visa 90/180 days rule starts to count upon switching to the new status. You are welcome to ask your questions and discuss the visa 90/180 days rule and other topics in this discussion forum. Basic fact: The Schengen visa 90/180 days rule says how many days a short-term visitor can spend in the Schengen area within every half year. Not complying with the 90/180 rule results in overstaying Schengen visa.